Home / Tutorials—FREE / Extra! Extra! Read All About It! 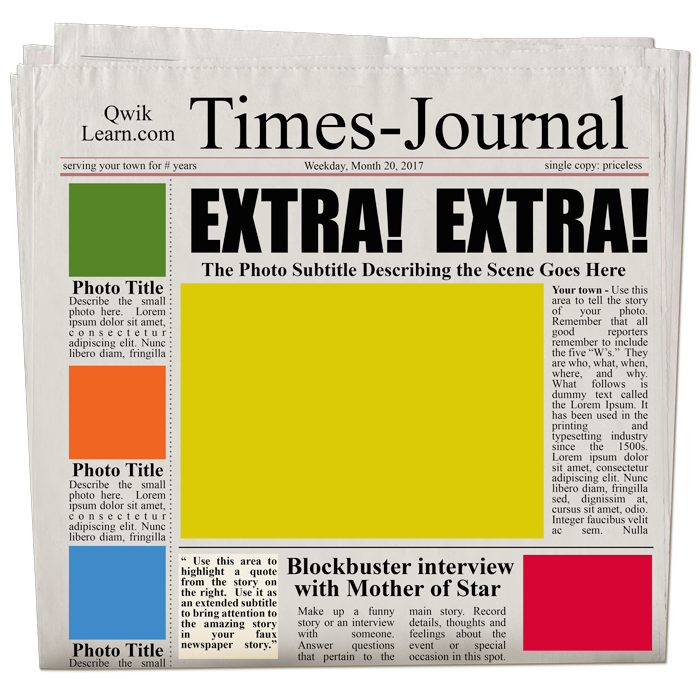 Create your own newspaper to put on a digital scrapbooking page with our custom newspaper template. This is an ENCORE tutorial. It was originally published April 6, 2009, by Sara Horton. It has been updated for current software. Open the tem-newspaper-DS.psd file (File > Open) from the download folder. NOTE: If Times New Roman and Impact are not installed on your computer, you will receive a font error when opening the template. Click OK to close the dialog box. If you do not have Times New Roman and Impact installed on your computer you will see a caution symbol in the Layers panel on the thumbnail of the type layers. No worries. You can change to a font you do have or you can leave the type layer as is. You may also be asked to allow a substitution font. In the Layers panel, click on the Text Path: Your Family Name layer to activate it. Double click directly on the thumbnail of that layer to highlight the text on the template. (optional) In the Tool Options, change the font and size. Begin typing to replace the text. Click the checkmark to commit the change. Repeat the steps above to replace all of the titles and text on the newspaper template. 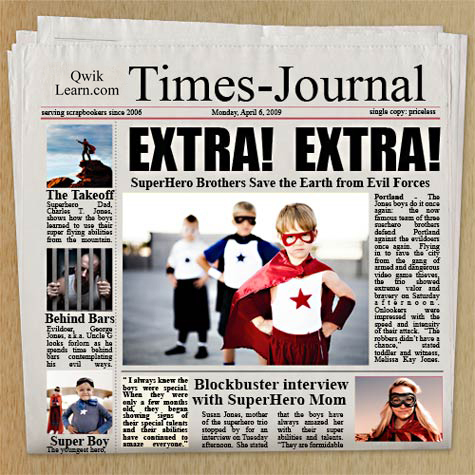 Get creative with the new text, adding funny quotes and interesting details for your newspaper stories. In the Layers panel, click on one of the photo clipping mask layers to active it. Click and drag the photo onto the template. Press and hold the Shift key before letting go of the mouse so that the photo lands in the center of the document. Note: In the Layers panel, the new photo layer should be directly above the photo clipping mask layer. If it is not, click and drag it there now. On the document, if you cannot see the corner handles of the bounding box, press Ctrl 0 (Mac: Cmd 0). Click and drag from the corner handles of the bounding box to resize the image to fit in the mask. (Photoshop: Hold down the Shift key while resizing.) To reposition the image, click and drag inside the bounding box. Save your newspaper (File > Save As) as a PSD file with a unique name. Close the working copy without saving. Your loved ones are sure to enjoy seeing themselves as front page news features on your scrapbook pages. The newspaper template also makes wonderful greeting card fronts. Imagine how Dad would like seeing himself as “Dad of the Year” the hometown news! You can even earn a few points with your Boss by tacking a “Boss of the Year” newspaper poster in the lunchroom of your workplace. Thank you! This has been fun. You gave me a great idea with the card; hope to give it to my grandson’s teacher. I used this template one time several years ago and was planning to use it again, so am glad to get the update, but I really wanted to comment on updating the oldies but goodies – GREAT IDEA!!!! I LOVE this, Thanks!! Jen. Love getting the updates on the old tutorials. I remember this tutorial. So glad it is updated and I can play with it. Love the tutorials you guys post!! Always a great website.